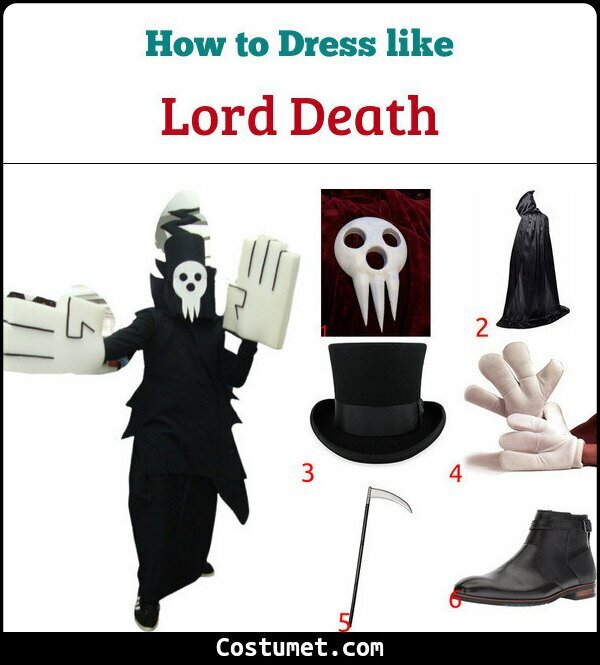 Lord Death is nothing like your typical death character. He brings a whole new perspective to the interpretation of Death brought to life. Unlike the typical scary or intimidating death character, Lord Death is a silly and only slightly insane comical character. His skull face and his bony hands are oversize and exaggerated to make him look more friendly. Though he wears a black cloak and hat, his hat has an extra twist to it to make it more kooky. He has a weapon since he is a meister, which is a large scythe, perfect for his character. 1 Mask, skull, costume One of the most remarkable pieces of Lord Deaths look is his very large and cartoonish face that is meant to be a silly and funny looking skull. 2 Cloak, black, large Around his body Lord Death wears a large black cloak that looks like it’s floating around him. 3 Hat, black His hat is a black hat very similar to this top hat. He has a pointy piece at the top of his hat which you can achieve by pulling the hood of your cloak over your hat. 4 Gloves, white, costume His hands are similar to his face and head. They are meant to be large, white, silly, and cartoonish. 5 Scythe, costume Lord Death is a meister and his human weapon happens to be a huge scythe which fits perfectly. 6 Shoes, black These sleek black shoes will blend in nicely with the black cloak and won’t stand out, since Lord Death isn’t shown with feet or shoes. Lord Death, or Shinigami is the king and leader of the Soul Eater. He created the DWMA school for meisters and weapons to train and learn in. Lord Death one looked like the typical interpretations of Death in a scary way, but after opening the school, he changed his appearance into a more cartoonish and friendly look. He is voiced by Japanese voice actor Rikiya Koyama. La Muerte looks regal in her long red, long-sleeved dress bedecked with marigolds all over. She also loves her very wide red sombrero which also has marigolds and candles on top of it.